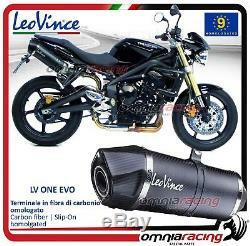 Leovince lv one evo 2 homologated carbon exhausts for triple triumph street 675 2007> 2012. Slip-on system carbon fiber homologated. The new lv one evo carbon is a synthesis of tradition and modernity. This silencer combines the classic style leovince in look and innovative research of the highest performing and lightweight materials. The carbon fiber silencer body of the lv one evo carbon ensures the highest performance optimization with its lightness. The design with square lines gives it an exclusive compactness. Leovince full carbon thing for the output cup that characterizes all the lv one evo carbon: resistant to high temperatures and an asymmetric cut, combines performance and lightness of carbon fiber without giving up made in italy style. The exhaust is in full carbon, really lightweight and suitable for those seeking darker tones. The muffler assembly does not require any modifications to the motorcycle and comes with a carbon clamp for fastening. In 1994, the passion and experience of manufacturing bertollini created omnia racing, with the aim of representing a reference point for everyone fond of bikes. In 2000, when salvatore orefice joins omnia racing, the company is founded, a society based on the passion and competence needed to create and trade the top products for motorbikes. Our continuous search for perfection and performance, using advanced technologies, has allowed us to interact with internationally recognized pilots and teams. Our products are excellent for both road and circuit use. They are continually tested by our technicians and pilots, thus improving the dynamics, dynamics and structural features of the materials adopted. The experience gained through the years of the competition has been greatly improved. Accostato, afam, aim, akrapovic, andreani, arrow, bazzaz, bc battery controller, bitubo, bmc, braking, brembo, bst, capit, castrol, derry moto, tuning fork, did, discacciati, eibach, ek, fabbri, far, frentubo , galfer, gbracing, giannelli, gifrap, givi, gopro hero, gpt, h2o, hagon, ixil, jollymoto, kappa, laser, lcr saddle, leovince, lightech, mafra, marchesini, marvic, marzocchi, matris, mivv, mra, nissin , ohlins, pbr, polini, pt, rizoma, rme, robby moto, sachs, stm, stomp, superb, suter, termignoni, valtermoto. Omnia racing is one of several important events: padova expo bike, national and international races, free circuit sessions. On the web, we are always associated with a direct contact with the customers, so we suggest the product that best suits their needs. This should allow our customers to feel at ease. All this has not been a decade ago, a reference point in italy; in addition, our products are still in demand in Europe and in the United States. The item "leovince lv one evo 2 exhaust pipe carbon triumph street triple 675 0712" goes on sale since Tuesday, November 7, 2017. It belongs to the category "vehicles \ parts, accessories \ motorcycle \ parts \ systems" exhaust \ silent.
" The seller is "omnia-racing" and is located at 80055. This item can be delivered anywhere in the world.